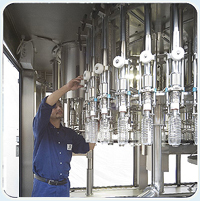 The “BASELESS” system is applied to all rinsing, filling and capping machines manufactured by METALNOVA S.p.A. Sometimes called an “up side down” filler the machine was developed to improve the performance of machines for PET and now implemented on equipment for glass as well. – The first major benefit is its cleaning and hygiene credentials. 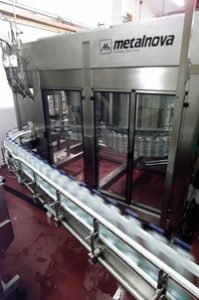 This is achieved by no stagnation zones under the bottles, no moving parts over uncapped bottles, sterile air filtration easy to clean and sterilisable by steam. (optional) and also differential sterile air pressures between the rinsing, filling and capping zones (optional). In fact the filler is a self contained filling room by definition of its fundamental design not a bolt on add-on. If you want a clean filler then it must be baseless. – One benefit of the baseless filler machine is improved production efficiency as it allows rapid intervention by the machine operator due to the easy access. Due to the free space design there are no machine stops due to broken or damaged bottles. An enhanced neck handling system allows quick change over for PET bottles and for glass the quick change over system requires no tools. Direct gearing is used throughout the machine thus avoiding “play” experienced with other drive systems. The fillers are available monobloced with bottle cleaner / capper and are available across the range of fillers from flow meter to counter pressure to gravity and on all bottle sizes up to 19 litre. If you need hygiene and efficiency then you need “baseless”.